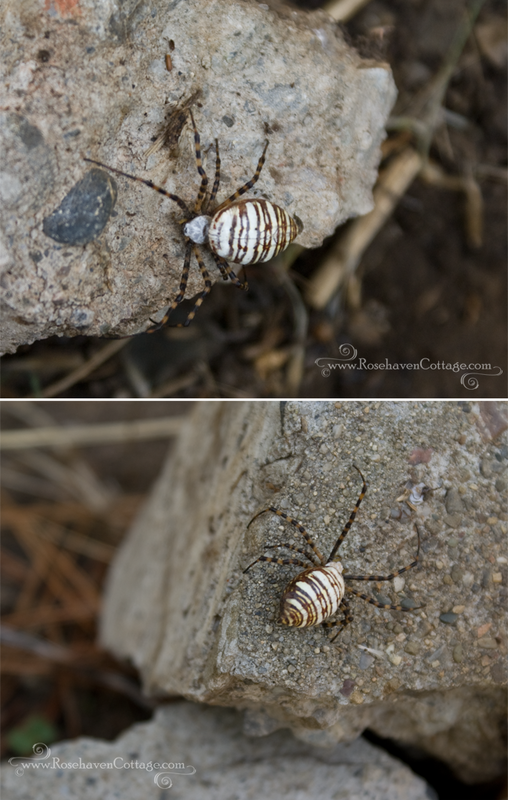 Years ago, on a drizzly autumn day in November we encountered a very fancy looking largish spider out in the garden. We'd never seen one before. We took photos of it. And then we spent the next several years wondering what kind of spider it was. While out in the garden on Monday, I finally encountered another one. With her backend measuring about 1/2 inch in length she was hard to miss as she moved through some weeds that I had just cut down. I didn't have my camera with me, but studied her for quite some time so I could go inside later and use the internet to finally make a positive indentification. Thanks to www.InsectIdentification.org I finally identified her species. She's a banded garden spider! Today, I was back out in the garden working in the same general area and spotted another one (or maybe the same one). This time I went in and got my camera. I'm glad I did. I could have used a spydy alert before clicking on this baby. That totally freaked me out, Ha ha. No really it's making me hyperventilate. Oh no! Poor Jen! I thought the word "spider" in the title would be enough of an alert for those that get the heebie jeebies from pics of creepy crawlies. Sorry about that. She's beautiful! I love the clear shots you got of her. Great job. Thanks for the info. As one of Elsie's daughters... I would just take photos and leave her alone. Sarah--Oh yeah! I totally dig preying mantis. I could watch them for hours... much longer than I'd watch a spider (even this beauty). I just wanted to know where she was and then give her a wide berth so I didn't hurt her.